Alejandro Soler, Nabindranauth Nandalall, and Shivnarine Lauchman. PARKCHESTER, Bronx (WABC) -- Fire marshals have arrested three men in connection with a five-alarm fire that damaged several buildings in the Bronx Thursday. Nine people were hurt, eight of them firefighters, in the blaze on Olmstead Avenue in the Parkchester section. 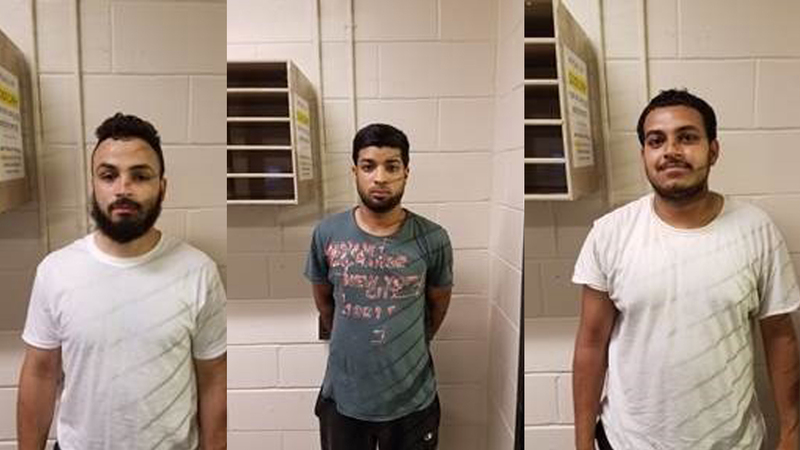 Alejandro Soler, Nabindranauth Nandalall, and Shivnarine Lauchman are facing multiple charges, including arson, reckless endangerment, and illegal possession of fireworks. Investigators say the men admitted to having a 'fireworks fight' shortly before the fire. "This fire is a reminder that fireworks are illegal in New York City - and as witnessed in this fire can be dangerous to both Firefighters and civilians alike," said FDNY Commissioner Daniel Nigro. Soler, 27, of the Bronx, is charged only with illegal possession of fireworks. Soler claims to have purchased the fireworks at a large retail store in Westchester, authorities said. Nandalall, 23, of the Bronx, and Lauchman, 23, of the Bronx, are charged with fourth-degree arson, reckless endangerment, criminal mischief, and illegal possession of fireworks - also purchased from a large retailer in Westchester. Both Nandalall and Lauchman admitted to having a "fireworks fight" shortly before the fire at Olmstead Avenue.